Woodworking with Mr. C (I leave out his name for his own sake, but those who had him will recall he had a rhyme to remember his name by) - We built your standard memo holder, keyholder, decorative shape hanger, etc. Art Class with Mrs. Lady from NYC Art Scene - It's awful that I can't remember her name, but I learned a lot about artists and art theory from her. Band/Orchestra/Chorus/Music Appreciation - I had band with Mr. Guido. I will print his name because he was awesome. I got detention a bunch in his class for talking. It was fun detention though because we'd look through his record collection and listen to music as he would tell me that I was a good kid, but I just had to learn to shut my freakin' mouth. Home Economics with PMS. I sh*t you not folks. The woman's initials were PMS. PMS was a crazy teacher to have in your pubescence. It was honestly quite weird to learn about this crazy new thing that was happening to your body which is the Pre-Menstraul Syndrom, but to have a physical embodiment of it standing before you by exact initials - it was a pre-teen clowns dream come true. She was something out of a Roald Dahl book. Tall and lean with smokey glasses and voice. A stern woman that would lurk about the classroom. And my peers in that particular class were ones I became rather close with. Four of us in particular were thick as theives, all of us named Susan. Three of us went by the name Sue, and there was one girl who went by the name Susan. None of us liked to be called Susie, and I was often referred to as Funke. This was not just because I had the distinct last name, but I am also the youngest of four children. The three of them had also had the honors of learning via PMS. The sewing test was to make a sweat shirt. You were allowed to pick out the color, but everyone had the same fabric. This was the standard test everyone had every year. This resulted in sibling spectrums of mishapen boldly colored sweatshirts for generations of Garden City families. The cooking portion was the one that PMS was the most empathic about. She made it clear that you had to learn to cook. For it was not just your grade that depended on it, it was also your life. This was not so much taught to us, but drilled into us by PMS. Her creepy coarse voice would dictate to you how to cook basic meals. Anyway, the one lesson I do recall, that I believe each and every one of her students probably never could forget- was Bisquick. Could I make pizza with Bisquick? Of course! You can use Bisquick for the crust! All you need is water, sauce and cheese! You've already got the base, Bisquick. You can make the buns. What if all I have is water? Can I make anything with Bisquick then? What if all I have is a rusty nail, a magnifying glass, Bisquick, and a dream? You can stay after for detention. We made about ten different dishes with Bisquick. Each one was proceeded with the lesson that Bisquick is versatile, and that it must be measured PRECISELY. PMS would give us a recipe, then she'd walk through it, then we'd have to make it by ourselves in a team of 5. Maybe this is why I love Top Chef, because in Middle School we had our very own bake-off's and were judged harshly. Except I don't really feel like Colicchio could hold a candle to PMS. No, really, he wouldn't be able to do it. She's that creepy. Did I mention she had a name plate with just her initials? It was like she was giving the joke away, seriously. As ridiculous and bizarre as the woman was, today I as I enter into my new apartment and do my first self shopping trip as an adult - I found myself writing Bisquick at the top of my list. At first, it was just for pancakes. Then, I found myself wanting a bisquit with my soup, so I threw some Bisquick and water in a pan. Now, not even an hour ago I found myself craving cookies. Unfortunately, I knew this craving would come and diet-minded Sue did not purchase dough, or a quick mix. But what diet-minded Sue did not count on was the wiley cunning skills of the cookie craving mind. 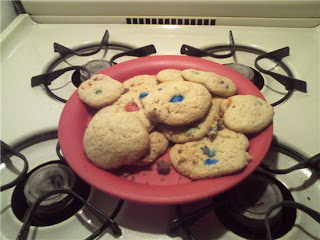 For, I looked up cookies by scratch online, and when I came up with no baking soda or powder (For Shame!) I realized - I had the Bisquick. I then remembered PMS standing there in her revelry, "If you add spices to the Bisquick it picks up the flavor quite easily." Bam! Homemade cookies that are fluffy and ridiculously good in 20 minutes were born. The only problem, Bisquick is so freakin' heavy. I had like three cookies and can still feel them. Was it worth it though? So, whereever you are PMS thank you for your ridiculous love of Bisquick. And the weird characterization of PMS.